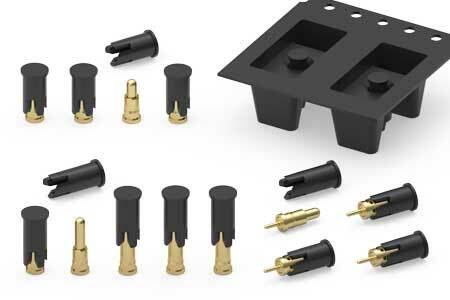 Mill-Max announces a new option for automated assembly of spring-loaded pins with the introduction of removable pick & place caps. The new 806 series features standard Mill-Max spring-loaded pogo pins with removable caps which keep parts centered in the carrier tape pocket, present a large round target surface for vacuum pick up and are easily removed after the soldering process. Some components, particularly individual terminals and pins, are poorly suited for pick & place carrier tape packaging due to their geometry. To solve this problem it’s often necessary to add an accessory to the part to accommodate packaging and automated assembly; these removable caps do just that. They are the ideal solution for applications in which the production volume necessitates automatic assembly yet an insulator is not required or feasible. The removable caps attach to the body of the spring pin, slipping over without compressing or damaging the plunger. The four finger design creates compliancy making the cap easy to remove. The closed flat top ensures reliable vacuum pick up every time.